As F3F competitions go, the Welsh Open is a veritable institution, taking place on some of the best slopes anywhere in Europe. There were 48 competitors this year, from the UK, Germany, Holland, Switzerland, Austria and Spain. Each day presented its own challenges in terms of contour and wind, making for a fascinating contest - with some nail biting swings in the leader board. And despite a somewhat inauspicious start, 13 rounds were flown. The omens weren't good. Clag and driving wet fog/rain/drizzle managed to permeate our bodies faster than our models could penetrate the breeze. Yet somehow we managed to achieve a couple of rounds, the second of which was 3-way group scored. 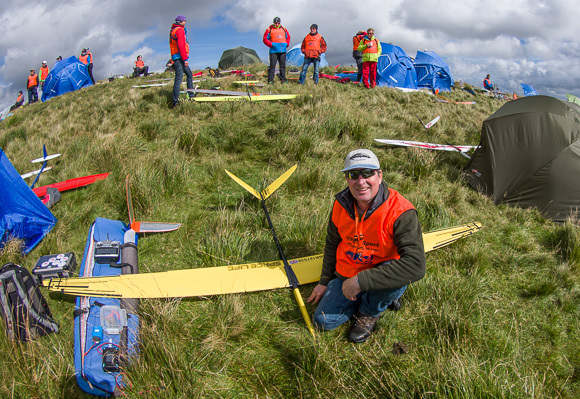 Simon Thornton tamed the conditions with some awesome flying with his Shinto. Greg Dakin followed in second followed by an aggressive Mark Abbotts in third. Eventual winner Alvaro Silgado was tucked in just behind, flying his Pike Precision. The weather on the second day was a complete contrast - much sunnier and with lighter winds. Five rounds were flown. Simon managed to hold on to the lead, with Greg moving up into second and Alvaro climbing a rung up the ladder to reach third. Kev Newton moved up three places into fourth position. Mark Abbotts was one who lost out, giving up five places. It was all change again on the final day, with a move to the Back of the Wrecker. Conditions, though somewhat variable, provided the fastest times of the competition. Simon Thornton missed out on the good stuff, losing a chance of a podium place. Greg Dakin took advantage to post a splendid FTC of 30.31 in the third round. However, it wasn't quite enough to overcome Alvaro, who managed to pip everyone to take a splendid win, with Inaki following in second and Greg third. The final scores show just how close it was at the top - all in all, this was a classic Welsh Open. Thanks to Kevin (all the way from Scotland), helpers and sponsors MKS/T9 HobbySport.